Earlier this year the World Health Organization (WHO) reported that in 2012 around 7 million people died as a direct result of air pollution. That is more than the entire number currently living on the island of Ireland. The figure is more than double previous estimates and represents one in eight of the total global population. We now know for sure that airborne pollutant gases and particles represent the world’s largest single environmental health risk. The highest contribution to the total loading of pollutants monitored in urban areas is road traffic: it comes from both exhaust emission and non-exhaust sources (like tyre- and brake-wear). But are all vehicle sources of equal concern to us? 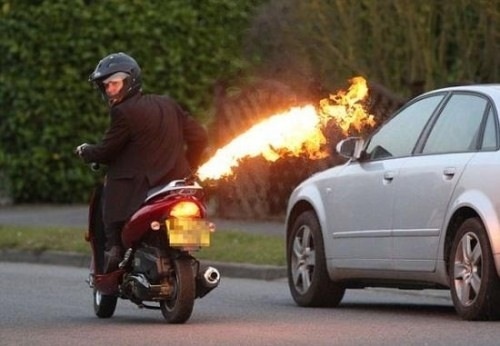 If you have ever been stopped at traffic lights, either as a driver or pedestrian, and an idling moped happens to be there too, you have likely suffered eye, nose and throat irritation. The unpleasantness is obviously associated with the large amounts of blue smoke that they emit…but how harmful is it to our health? Probably there is no need to worry if it doesn’t happen to you often but fuel combustion, whether it be solid or liquid or indoors or outdoors, can be highly toxic because of carcinogenic chemical contents. None of the pollutants (including carbon dioxide) that are emitted from scooters or mopeds are monitored or regulated and they generally carry just one person. In fact if ANY car or truck with a diesel engine put out even a very small fraction of the pollutants a 2-stroke does, it would fail regular vehicle tests such as the NCT in Ireland or the MOT in the UK. Simply put it would be banned from being driven on roads. So from both climate change and air health perspectives the question must be asked: Is it fair that the road tax on 2-strokes in Ireland can be as little as €49 per year? Especially as the EU has adopted the “polluter pays principle”. The reason why 2-strokes are so “dirty” is because they run on a premixed fuel-oil lubrication (petroil) that is burnt within an inefficient combustion engine. The exhausts then carry many different types of unburnt and partially burnt hydrocarbons that become oxidized in air. These secondary chemicals can then clump together to make the fine, toxic particulate matter that is so harmful to our health. The new research on vehicle emissions shows that we have seriously underestimated the pollution effect of the inefficient burning of petroil in 2-strokes. And it could be a problem for us all whether we live in very highly populated areas like Calcutta or in small cities like Cork. The 2-stroke traffic problem is not confined to places like Thailand, China and India or European cities like Barcelona and Naples. If you get a hit from toxic SOA then it is still a hit no matter if it comes from one moped or 1,000 of them because we have no lower threshold limit for particulate matter to damage human health. Unfortunately, in Ireland, as the economy has dipped and because unaccompanied 16-year olds can drive them, the number of 2-strokes on our roads has increased considerably over the last fifteen years; they are also unregulated and their road tax is relatively cheap. So what can we do about 2-stroke transport? Technically, if the fuel composition was changed so that no aromatic compounds (meaning chemicals of the benzene family) were present then the problem might be solved. Regulation such as an NCT might also help….but 2-strokes would never pass with the current rules we have for trucks and cars. Perhaps their road tax could be increased by a factor of 1000. That would mean changing the basis on which Ireland operates road tax once again. Sensibly this has moved from a crude, engine size or cc system, to one based on the emissions of carbon dioxide, for climate change reasons. On the other hand issues associated with air pollution have never been included in calculations of road tax. Maybe they should….because we now recognize that climate change and air quality processes are fully intertwined. One final thing, if you really want to avoid becoming a WHO statistic: wear a face mask the next time you get your 2-stroke strimmer or chain-saw out for those garden jobs. I know that I shall!